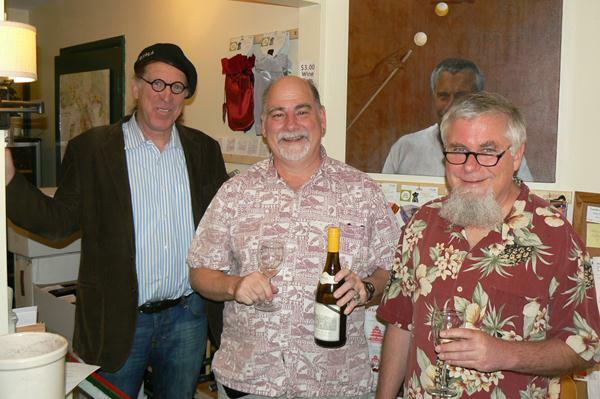 Madrona Wine Merchants » Randall Grahm Of Bonny Doon Visits. Randall Grahm Of Bonny Doon Visits. Randall Grahm, owner and winemaker for Bonny Doon Vineyards in Santa Cruz, California dropped in to show us his latest offerings. We currently carry two of his fine wines: Le Cigare Volant and Cloy de Gilroy. The newly released cuvée is the 23rd edition of Le Cigare Volant, and it certainly shows the family flavor profile of red fruits, herbal, and earthy notes in a savory, medium-bodied package. Bright ruby red with a pale purplish rim, it offers cherry aromas with a bit of spice, menthol, sassafras, and black pepper. On the palate there is fresh cherry, pomegranate, and red bramble fruit. The wine is peppery and lively with good acidity around an earthy, savory core. A blend of grenache, syrah, and mourvèdre with just a soupçon of cinsault makes for a bright and wonderfully gamey wine. The chief red in residence, grenache, derives primarily from our traditional Biodynamic® grenache source from Alta Loma Vineyard in Monterey County. This is supplemented with a smidge of our own Estate grenache, adding a discreet spiciness to the attraction. The syrah is principally sourced from Bien Nacido Vineyard in Santa Maria Valley, which produces the closest analogue we have found to a Northern Rhône syrah—tannic and meaty in the lower registers; peppery, fruitful, and delicately floral in the top, all the while showing great balance and harmony. A group of non-irrigated, centenarian Contra Costa vineyards has provided mourvèdre for Cigare for many years. Finally, a dollop of cinsault provides a very particular fragrance of flowers and aromatic herbs. The Wine Formerly Known as Clos de Gilroy (TWFKaCdG) pays homage to the quaint, rustic town of Gilroy, the spiritual locus of all matters alliaceous. The fruit for our Grenache does not, despite its name, derive from Gilroy (clos, but no Cigare), but instead primarily from our former estate vineyard in Soledad and the Alta Loma vineyard in Greenfield, along with a sprinkling of other vineyards along the Central Coast. The wine exhibits all the hallmarks of exceptional cool climate Grenache—bright raspberries, a strong suggestion of blacknpepper and red fruits, and a supple, lingering finish. The strawberry-rhubarbity of grenache is complemented by a delicate note of kirsch from cinsault and the spicy catch of syrah’s white pepper. Brilliant rubescent pink with a fuchsia rim, the wine is intensely aromatic, with notes of strawberry, raspberry, pepper, and wild herbs. Supple and medium-bodied, the dominant flavors on the palate are of red fruits: strawberry, red currant, kirsch, and strawberry-rhubarb. Fruity and spicy but fully dry, this wine is the perfect foil for all manner of grilled meat or vegetables, roasted poultry, the aïoli platter (naturellement), and anything prepared al fresco—especially when anointed with olive oil. As you can see, he’s a pretty funny guy.